Meeting was called to order by Vice-Mayor Annette Fairbanks with Commissioner Gary Farris, Commissioner Gwen Mai and Commissioner John Garcia responding to roll call. Mayor Brian Linin was reported absent. Also present were Joni Showalter-Police Chief, Suzanne McClure – Economic Development Director, Alex Weis – Code Enforcement, Sami Philbrick – Museum Director, LeAnn Taylor – Municipal Court Clerk/Judge, Jake Kling – City Attorney, Mary Volk – City Clerk, and Andrew Finzen – City Manager. Unfit Structure: 408 W. 6th – Alex stated, in our last discussion, property owners had three items remaining to bring property to code. They have chimney fixed; the foundation and east porch roof cannot be complete until spring. I recommend property be taken off unfit structure list then if incomplete in a year, address property again. If we have to address again we will start over on property. Commissioner Garcia asked, will owners maintain communication with Alex? Alex stated, not if property is taken off list. David Sharon, property owner stated, I was digging foundation out but dealing with yard cleanup now. ON A MOTION by Commissioner Garcia to remove property at 408 W. 6th Street from Unfit Structure list seconded by Commissioner Farris. MOTION carried on a VOTE of 4-0. Appointments to Museum Board – Andrew stated, I recommend the reappointment of Jerry Nemechek and appointment of Larry Keirns to the Museum Board for three year terms. In addition, I recommend the appointment of Mary Porterfield to fill the open term expiring in 2018. Sami recommended all appointments. ON A MOTION by Commissioner Mai to approve board recommendations for the Museum Board as presented seconded by Commissioner Garcia. MOTION carried on a VOTE of 4-0. Appointments to Housing Authority Board – Andrew stated, in accordance with the letter of recommendation from Shelia Barnett, Goodland Housing Authority Director, I recommend the reappointment of Clyde Lambertz, Cara Daise and Harold Gillihan to the Goodland Housing Authority Board. ON A MOTION by Commissioner Garcia to approve board recommendations for the Housing Authority as presented seconded by Commissioner Mai. MOTION carried on a VOTE of 4-0. Resolution 1487: Establishing CID Policies – Andrew stated, this is a renewal of CID policy approved in Resolution 1401 which sunset December 31, 2016. The sunset in this resolution is December 31, 2018. This allows the City to utilize the CID program as a mechanism for economic development. Individual CID applications will come before commission for approval. ON A MOTION by Commissioner Garcia to approve Resolution 1487: Establishing CID Policies seconded by Commissioner Farris. MOTION carried on a VOTE of 4-0. City Managers Report- 1. At last meeting the Commission discussed setting up joint meeting with County Commission. The County Commission is interested in scheduling a meeting. Does the Commission want to give potential dates or should I see what dates the County Commission can meet? Vice-Mayor Fairbanks stated, we have had joint meetings in the past and feel they were successful; I feel this a good idea. Commissioner Garcia stated, on the workshop I would set up a meeting for 7:30 a.m. then have the County Commission let us know some dates they have available for joint meeting. Consensus of Commission is to have Andrew work with County Commission for some dates to schedule joint meeting and then let us know. 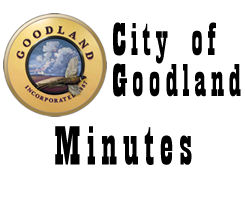 I am excited to work for Goodland, enthused about working with staff and feel will work together well to move ahead. 3. Second meeting in February will be held on 21st due to holiday. 4. The Commission has mail going to Jessica’s office, do you want us to just bring it to next meeting? Consensus of Commission is to bring mail to next meeting. 5. We had 546 pets registered today for free tag day. Commissioner Mai – 1. Thank crews for being prepared for storm. 2. Condolences to Rich and thank staff for helping out in his absence. Commissioner Farris – 1. Thank the Electric Department for getting electric fixed other night. Vice-Mayor Fairbanks – 1. Echo Commissioner Mai comments. ADJOURNMENT WAS HAD ON A MOTION Commissioner Garcia seconded by Commissioner Farris. Motion carried by unanimous VOTE, meeting Adjourned at 5:17 p.m.